There isn’t any one-size-fits-all approach when it comes to proper scalp hygiene. With that being said, many black women do not shampoo their hair frequently enough to maintain a healthy scalp environment. Culturally speaking, it’s quite typical for black women to shampoo their hair once every couple of weeks. Under normal circumstances this can work. Also, nowadays lots of young black women refrain from shampooing their hair in order to preserve a certain hairstyle. Either way many women of color tend to go to the opposite extreme instead, thinking that washing their hair less often is better. But in other cases many women go for even longer periods between shampoos. I know lots of women who shampoo their hair only a monthly basis. Children, especially those little girls with tons of hair most often get neglected. It’s not unheard of for young girls as well to go for extended periods without having a proper shampooing . These consistent extended periods between shampoos isn’t often enough and usually creates more problems. Years ago I discovered that a client of mine at the time, only had her hair shampooed when she came to the salon for her hair appointment. 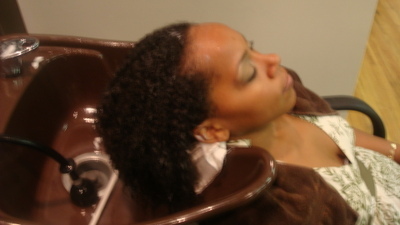 The problem was she only came to the salon when it was time for her relaxer service. This meant that her hair was only getting shampooed once every six weeks! It’s no wonder that it’s commonly thought among African American women that our hair just doesn’t grow! In the African American community just like any other, there are beliefs and customs that have been handed down from our ancestors for generations. I believe this pattern of infrequent shampooing stems from the traditions that were based on circumstances beyond our control centuries ago during the days of slavery. Several of those practices have survived into our modern day. I remember my mom relating some of her memories when it came to her hair as a young girl. As one of seven children, five of whom were girls, she recalls only having had her hair done around the holidays! In this age of information many of these ideas can now be seen as a colorful collection of folklore, myths and old wives tales. Here we are going to get Straight to the Root and shed some light in order to put these ideas that may be causing us more problems to rest. For instance, many of us have been taught that washing your hair too much is bad. In order to have a healthy scalp which leads to healthy longer, beautiful hair you must regularly shampoo your hair. A key component h2o, otherwise known as good old water, is the main ingredient needed along with the right type of shampoo in order to effectively cleanse and re-hydrate or add moisture to the scalp and hair. This should be done on a regular and consistent basis. You need to determine how often for your hair type and your lifestyle it is necessary to shampoo your hair. This will aid in keeping your scalp free of excess oils, dirt, etc. More often than not, the typical itchy scalp that is dry and feels tight is the result of an extended period of time without hydration from water. It also has a build up of dead skin cells, dried perspiration and hair product residue or “gunk” as I call it. Here’s what helps you to start thinking of your scalp as you would the skin on your face or other parts of your body. Just think of not washing your face or your entire body for one whole week. And while going without showering for one entire week, everyday you apply generous amounts of oil or lotion to your face and body. Then you proceed to go about your day. You are probably getting a “creepy crawly” feeling just imagining this scenario. How soon do you think it would be before you would start to itch, smell or break out in some sort of rash? Now think of that when it comes to your scalp. But in addition to that your scalp is usually covered by a lot more hair than your face or your body. If you didn’t think it was a big deal how often you shampooed your hair before, did this article have any impact on what you might do from now on? Please leave your comments.